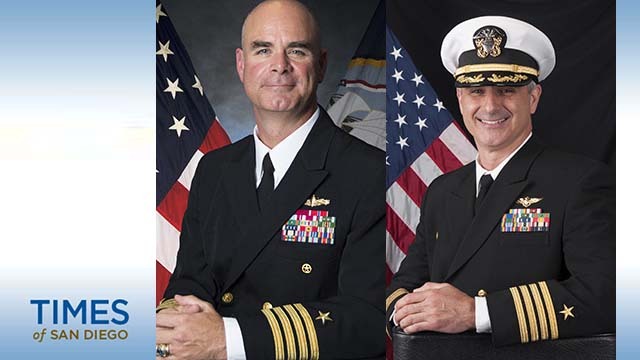 Four San Diego-based Navy captains were nominated Thursday to the rank of rear admiral (lower half), including one who shares a name tainted by scandal. Navy Capt. Michael A. Brookes, currently serving as information warfare commander, Carrier Strike Group One, San Diego,. Navy Capt. Brendan R. McLane, currently serving as chief of staff, Naval Surface Force, U.S. Pacific Fleet, San Diego. Navy Reserve Capt. Eric C. Ruttenberg, currently serving as commanding officer, Space and Naval Warfare Systems Reserve Program, San Diego. And Navy Capt. Douglas “V8” Verissimo, currently serving as commanding officer, USS Carl Vinson (CVN 70) at North Island. Brookes is not to be confused with disgraced Navy Capt. Michael Brooks of Virginia, who last year was sentenced in San Diego federal court to 41 months in prison for his role in the massive “Fat Leonard” bribery scandal. Federal Judge Janis Sammartino ordered Brooks, 59, to pay a $40,000 fine and $31,000 in restitution to the Navy. He pleaded guilty in 2016 to one count of conspiracy to commit bribery. “The Navy’s promotion system is based on service record strength but is also vacancy-driven and for flag officers is a highly political process,” says thebalance.com. Including common pay allowances, the average annual salary for a rear admiral lower half ranges from $128,221 to $178,246, according to military-ranks.org.